There are a lot of things I can spend my money on and a few things that I should spend money on and books always prove to be a good investment. This series called Weekend Read, will include posts about my favorite reads and resources related to cooking, healthy nutrition and tips for well-being. When we decided to move to the UK, our suitcase space was limited and a lot of things just didn’t make the cut. I ended up having to do things the old fashioned way and hand-write my favorite recipes from my family binder and personal cookbook collection. Pinterest, Instagram and food blogs are just about my favorite way to find recipe inspiration these days but there is something nostalgic and endearing about a shelf full of cookbooks in the kitchen including hand written recipe cards from generations past and friends present. 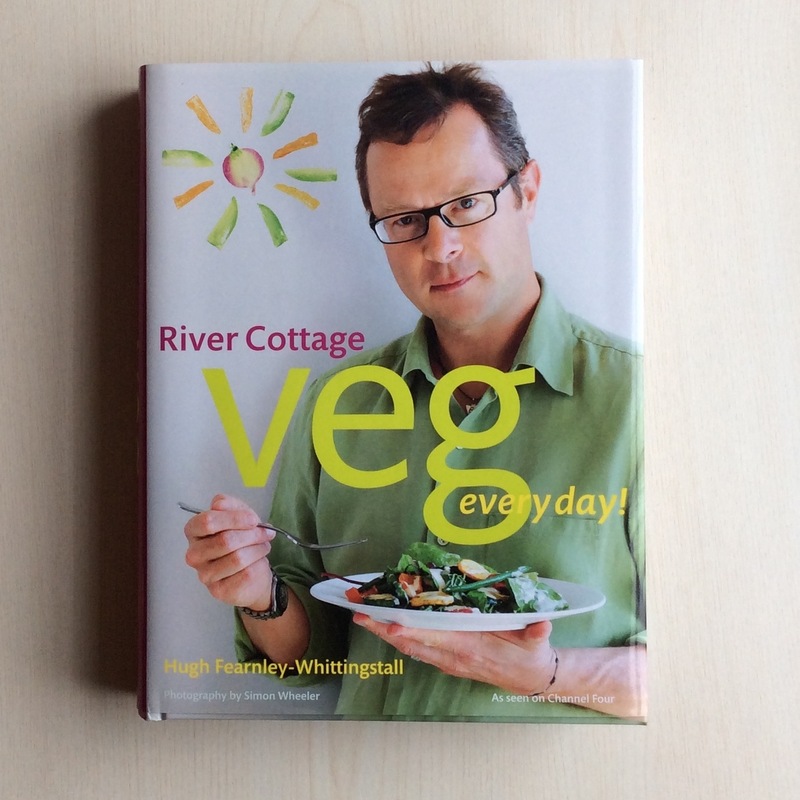 This cookbook by River Cottage is definitely worth checking out. River Cottage is known for easy and healthy recipes that incorporate the best of British larder. A dear friend recommended Veg Every Day right after moving to Scotland. Yes, I bought it. Yes, I broke the pact I had with my husband about accumulating things. And no, I don’t feel bad because it’s a book! I turn to this book when I need inspiration for something quick, healthy, in season and creative. Everything we have tried, has been delicious. The recipes are funky and get my taste buds dancing… peanut butter + lime + chili in a Sweet Potato + Peanut Gratin? Oh yes, ma’am. Since we are approaching the pot-luck, bring your own side dish, holiday season, here are two recipes that I tried recently and will definitely be sharing with friends this year. Both of these salads can be served warm or cold. They are bright, crunchy, flavorful and packed with nutrients! Heat a dry frying pan over a medium heat and add the walnuts. Toast gently for a few minutes, tossing often, until they smell toasted and are browning in a few places, put aside. Put the cumin seeds into the frying pan and toast gently for a minute or two, tossing a few times, just until they start to release their scent. Tip on to a plate to stop them cooking further. 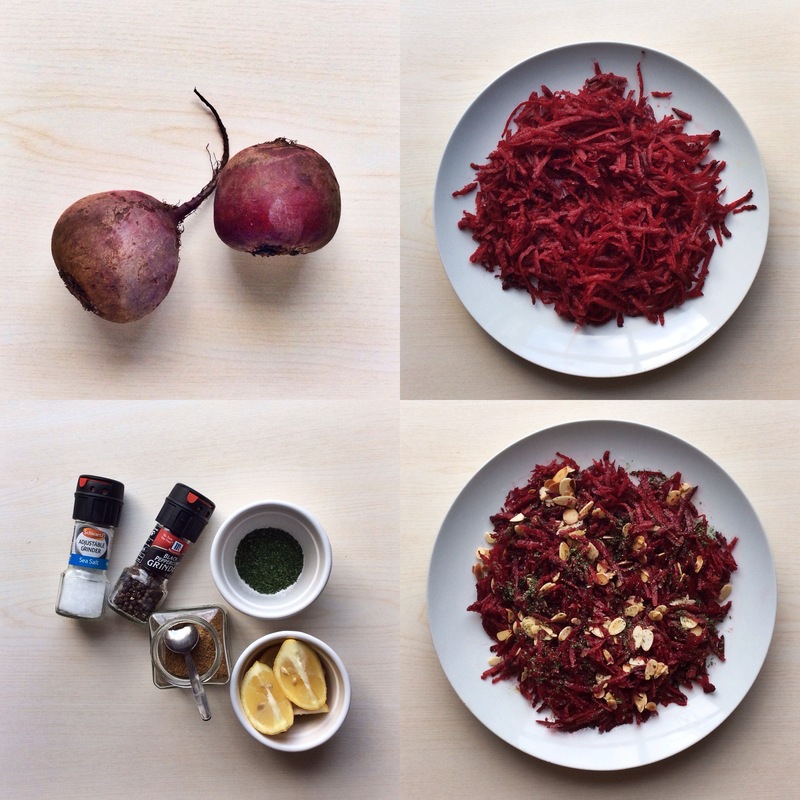 Peel the beetroot, grate it coarsely and put it in a bowl. (If you have fresh baby beetroot, just slice it very thin.) Add the parsley, orange juice, a squeeze of lemon and a tablespoon of rapeseed oil, and season. Stir, adjust the seasoning to taste and, if possible, leave for 20 minutes or so, during which time the dressing will marinate and soften the beetroot. 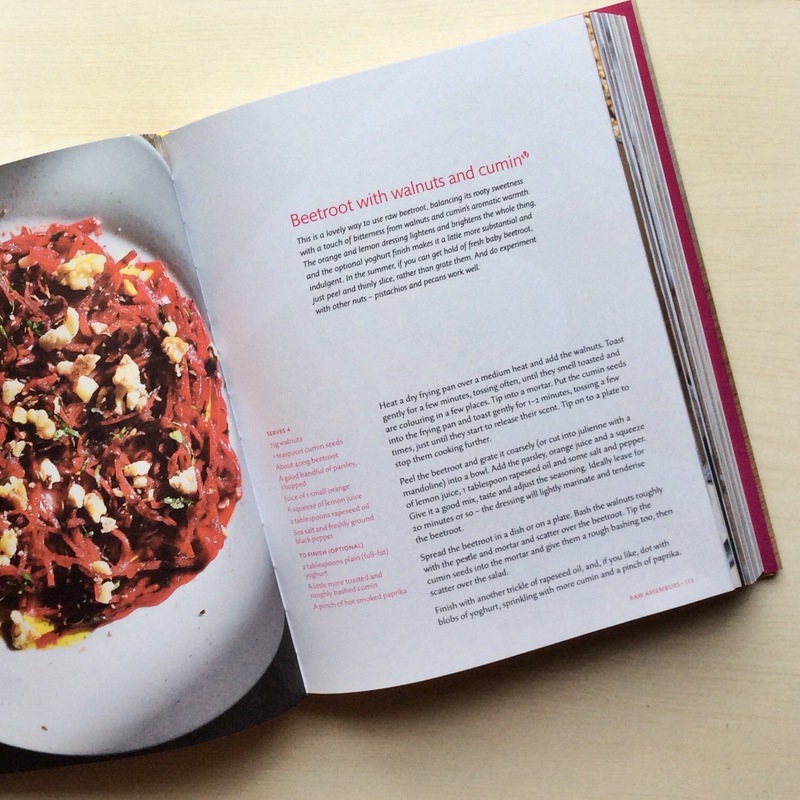 Spread the beetroot in a dish. Crumble the walnuts and scatter with cumin over the beets. For a delish finish, add a few drops of olive oil and dot with a couple spoonfuls of plain yogurt. Sprinkle on the remaining cumin and the paprika. Cut the top and bottom off the orange and stand it on one of the cut ends on a chopping board. Work your way around it, cutting off the skin, pith and membrane, then cut out the segments. Squeeze the juice from the segmented orange into a small bowl. 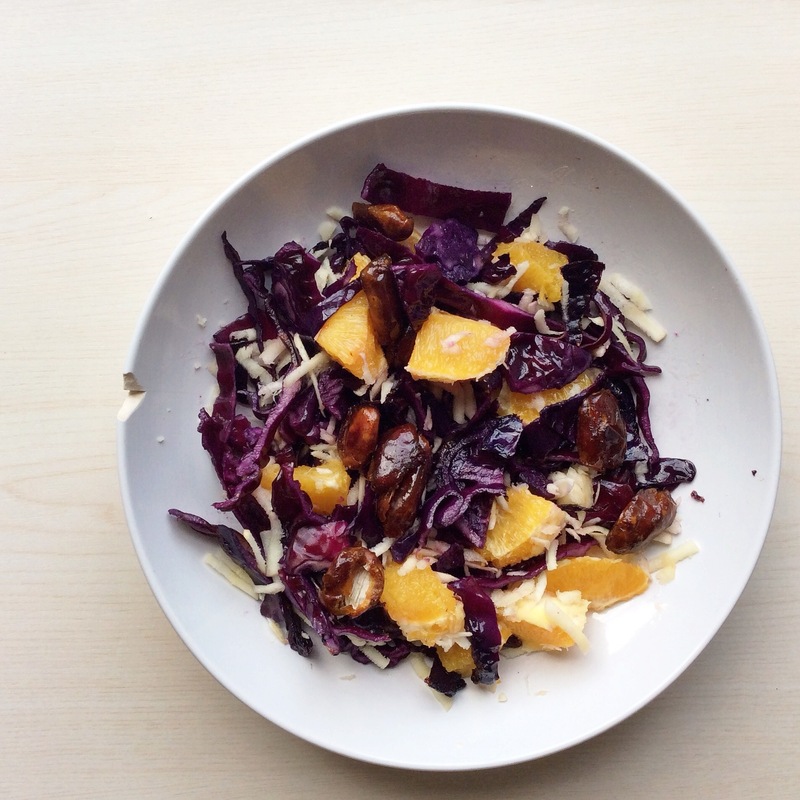 Arrange the cabbage on a large plate, or two smaller plates, along with the orange segments, parsnip and dates. Trickle over the reserved juice and olive oil, then sprinkle on the thyme leaves. Serve at once. Click here to view recipes from Veg Every Day! on the River Cottage website where you can find an index of many of their recipes. 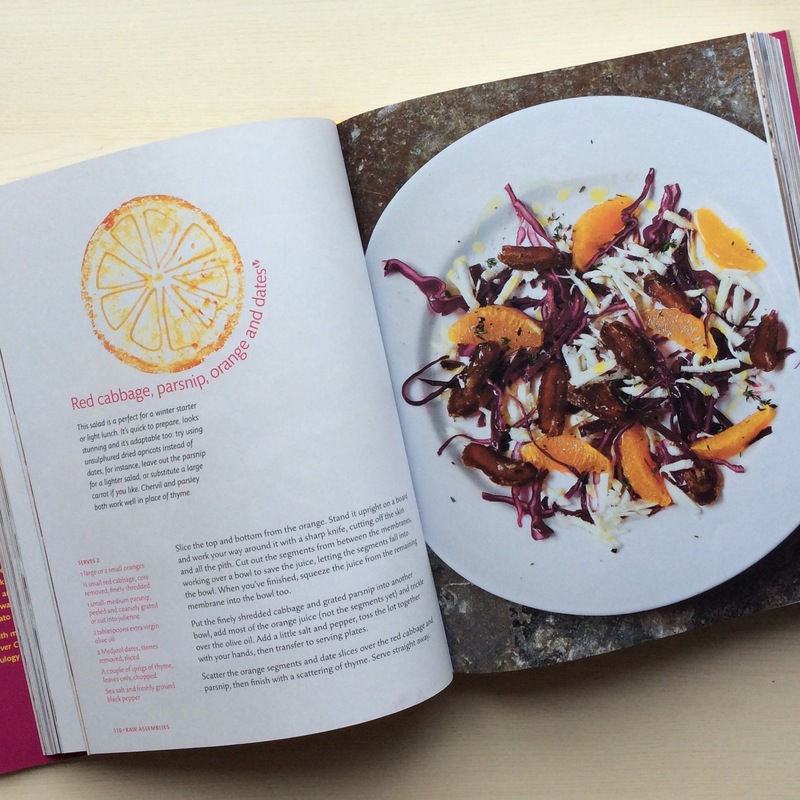 What are your favorite go-to cookbooks?